I suspect my Windows 20012 Certificate Server CRL revocation configuration is incorrect every time I generate a new CRL or a new Delta, only a maximum of 3 files are generated. I then looked on the file system and noticed that the intermediate was referencing a cert that was never created. So I went to the root CA, clicked on the node that said "revoked certificates" and hit publish. So my question is.. is it correct that a given CA will have a maximum of 3 CRLs with a varying suffix as listed above? Is it correct that a underscore name is never updated? 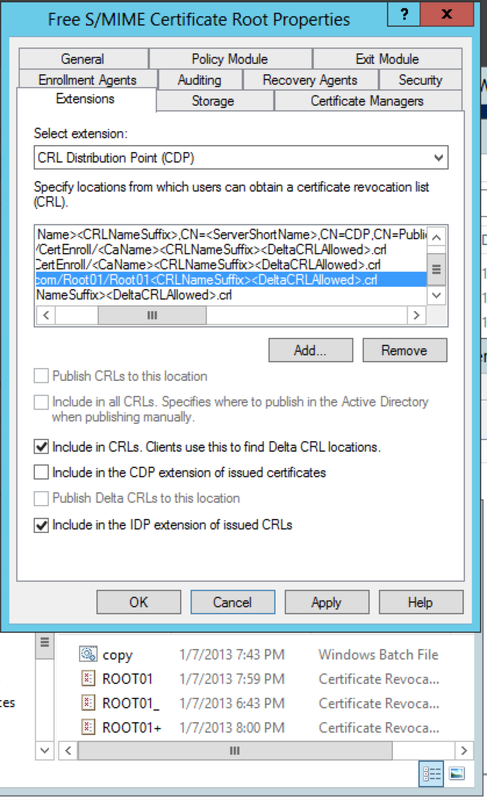 A "normal" setup with Microsoft's Certificate Services involves two CRL files: a base CRL and a delta CRL. The base CRL is destined to be referenced from a CRL Distribution Points extension in the issued certificate. The base CRL will contain a Freshest CRL extension which itself points to the delta CRL. Whenever a new base CRL is issued, a new delta CRL is issued immediately after; but the delta CRL can also be updated more often than the base CRL (and that's the point of using a delta CRL, by the way). By default, Certificate Services will force a new delta CRL whenever the previous one will soon expire, and also whenever a certificate is revoked. You do not need more than these two files. Remember that a CRL has any value only insofar as clients (who validate certificates) can find them, and they find them by following the URL found in other objects. End-entity certificates contain one URL for CRL download, therefore the current CRL must always be stored under that name. For the third file with an underscore, verify whether it is a ".crl" file (i.e. a CRL) or a ".crt" file (i.e. a certificate). It is normal and expected to have a copy of the CA certificate in that location. The name for that certificate will be derived (still by default) from the host name of the CA, and its domain name -- if you get nothing after the underscore, then I suppose that your CA is not part of an Active Directory domain. The CA certificate is referenced from the Authority Information Access extension of issued certificates, while CRL are referenced from the CRL Distribution Points extension of the same certificates. OCSP and CRLs: Specified in CA or client certificate? Why deploy a .p12 client certificate bundled with a root CA? How to add AltName from csr file to crt file using “openssl x509 -req”? Are revoked certificates removed from CRLs after expiration? Why is this secure? Is the Offline Root CA Obsolete?